Opgenomen in "Krinkel, Glenda's Place, Sailer's place, Helenalei"
1 guitar, 1 singer, 1 bass and a bit of gentle drums. Melodic guitars, a sweet voice, and a number of controlled fuzz-outbursts. The recepy of an ever greater number of bands, it seems (just thinking of COEM, JF Muck, Orange Black, Stafighter ...). But who is buying this stuff? Where's the market for it? - the marketeer in me asks (he's called Noël, and he's a bit retarted). Star Club West seem to be the sort of band that couldn't care less about such a question. Just quietly going about their stuff, dropping us 8 songs on little album. Intimistic ("How nice you drop by", "Enjoying the elbow room"), melodic ("Fragment drop"), energetic ("Liposuction") and all of this at once ("Stereo design", "Nick", "This is Howie"). 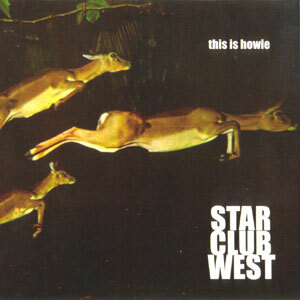 Star Club West cannot be denied an amount of quality, but - and this is the big but - all in all it's also an album that isn't really very exciting, mesmerizing and/or capturing. And that's even despite the shortness of it - 8 songs for 30 minutes. It's defintely okay, but not much more than that, I guess. Only the melody on "How nice you drop by" and the frenzied part in "This is Howie" managed to really touch me, the other songs seem to fit in too well with the background. This is Howie. Doesn't he blend in well. Good boy. Howdy Howie. - Andy Stevens voor UptoMusic : ""Er is een nieuwe ster aan het Belgisch popfirmament, een Star Club West! Net als labelgenoten Fence zoekt dit drietal zijn inspiratie bij Pavement (maar Star Club West zoekt ze dan wel in de iets zachtere nummers). ... Er is hier en daar nog een beetje werk aan de winkel, maar de intentie is er, en die belooft niets dan goeds." - TJ Hatton bij Kindamuzik : "Star Club West display a penchant for languidly delivered vocals, piano-tinged ballads, melancholic lyrics, and guitars that gently weep. They have plenty to recommend them ... Star Club West exist in the twilight zone that lies somewhere between evening and night, an all too brief period of time that brings with it a sensation of tranquility and calm." - bb in Rif-Raf (ned.ed.) : "Invloeden zijn er onder andere van Palace, Pavement en Yo La Tengo. Als dit u nieuwsgierig heeft gemaakt, moet u hen beslist gaan bekijken tijdens de Nachten. De plaat is alvast dik in orde"